Over three decades of reform and opening up have brought about remarkable development in China. The country has gained notable growth in comprehensive national strength and global influence. It is more closely interacting and connected with the world. With a population of 1.3 billion, China is a big country that is steadily moving towards modernisation. It has not only left its strong mark in the history of human progress but it is becoming an important factor that will shape the future of the region and beyond. The next decade will see an even more promising prospect for China's development. China's economy has entered into a stage of 'new normal'. The fundamentals in its economy remain positive in the long run. The country is rolling out its 13th Five-Year Plan in March for 2016-2020, which highlights five key development concepts, namely, innovation, balanced growth, a green economy, opening-up, and inclusive development. This five-year plan will mark the beginning of China's new journey of economic transition and upgrading. Structural reform will continue and the goal is to base growth on innovation, open up more space for growth through coordinated development and translate the ideas of green growth into concrete actions. China will improve the strategic layout of opening-up and bring moderate prosperity to everyone at home. A moderately prosperous society means US$12,000 GDP per capita by 2020, double the total GDP and average personal income from 2010. With the implementation of the 13th Five- Year Plan and the comprehensive deepening of reforms, growth in China in the next decade will be sound and steady. The next decade will see China making a greater contribution to the common development of the world. China's development has benefited much from the world and so has the world economy from China's growth. Since the global financial crisis, China has taken upon itself to drive the world economy when growth was needed most. In the coming years, China will continue to be the powerhouse for global growth as it adheres to all-round opening up and integrates itself more deeply into the world economy. The 'Belt and Road' initiative is one way to achieve this. 'Amity, sincerity, mutual benefit and inclusiveness' are the principles that China upholds as it moves ahead with the 'Belt and Road' initiative. Decisions on every project of this initiative will be made by all stake holders, actions will be taken jointly and the benefits will be shared by all partners. The 'Belt and Road' will be a massive economic belt that links up the Asia-Pacific in the East with Europe in the West, and strings up emerging economies.It is unprecedented in its span and coverage. It will become a new source of global growth and will create more opportunities and benefits for the common development of the world. China will also work for common development through international cooperation. When President Xi Jinping addressed the United Nations Sustainable Development Summit in September 2015 in New York, he announced the establishment of an assistance fund for south-south cooperation, with an initial pledge of US$2 billion in support of developing countries' implementation of the 2030 Agenda for Sustainable Development. The next decade will see China playing a stronger role in facilitating multilateral cooperation. Acting within the realm of its capability, China has been a major, responsible player in global and regional cooperation. At the General Debate of the 70th Session of the United Nations General Assembly, President Xi announced that China will establish a 10-year, US$1 billion China-UN Peace and Development Fund to support the United Nations' work and advance multilateral cooperation. China is entrusted by the international community to host the 2016 G20 Summit in Hangzhou. This is a demonstration of China's commitment to a greater contribution to global economic governance. By participating in global governance, China wants to join hands with other members of the international community to advocate a new type of international relations featuring win-win cooperation, and to build a community of shared future for mankind. But China does not intend to reinvent the wheel. Instead, China will staunchly uphold the existing international order and system underpinned by the purposes and principles of the United Nations Charter. In the meantime, reforms of the global governance mechanisms are needed in order to make them fairer and more equitable; and to reflect the trend of a multi-polar world, globalisation, and the common wishes of the developing world. The next decade will see China committing greater efforts to build world peace and stability. China follows the path of peaceful development. This is a strategic choice that China has made based on the trend of the times and its fundamental national interests. In line with this strategy, China advocates common, comprehensive, cooperative and sustainable security, and sticks to peaceful means for resolving international and regional hotspot issues. Hegemony or expansion has never been an option. Instead, China values friendship and partnership with its neighbours, and seeks to safeguard the hard-won regional peace and stability through unity and cooperation among Asian countries. In the South China Sea, for example, China is ready to work with the countries in the region to make sure it will be a sea of peace, friendship and cooperation. China's development is a contributing factor for world peace. Again, at the General Debate of the United Nations General Assembly, President Xi announced that China will join the new United Nations Peacekeeping Capability Readiness System. It will take the lead in setting up a permanent peacekeeping police squad and build a peacekeeping standby force of 8,000 troops. Moreover, China will provide a total of US$100 million of free military assistance to the African Union in the next five years to support the establishment of the African Standby Force and the African Capacity for Immediate Response to Crisis. Both China and the UK are major countries with global influence and both are committed to the lofty task of promoting world peace and development. Last October, President Xi paid a successful State Visit to the UK. Leaders of our two countries agreed to build a China-UK global comprehensive strategic partnership for the 21st century and usher in a 'Golden Era' for the lasting, open and win-win relationship. The agreement further enriched China-UK ties, but the effect is not limited to between our two countries. China-UK cooperation will have an exemplary effect for the whole world. In the coming decade, China looks to work with the UK and other members of the international community to uphold world peace and security, to share development opportunities, and to build a promising future for mankind together. Asia House is a British non-profit organization that aims at prompting trade and economic development and cultural communication in Asia. Its members are mostly renowned institutions, large corporations and leaders from all walks of life. 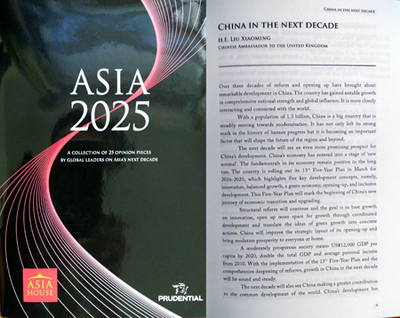 The new book "Asia 2025" marks the 20th anniversary of Asia House. It carries articles by 25 global leaders from the political, commercial and academic fields and shares opinions on the future development of Asian countries, regional cooperation as well as commercial interactions with countries outside the region from three aspects: politics and economy, commerce and trade, and innovation and society. The other contributors of articles include Vice President of Indonesia Usuf Kalla , Secretary-General of ASEAN Le Luong Minh and former Director-General of the World Trade Organization Pascal Lamy. The book will provide Asia House members with references on policy-making.